In one of its larger updates since its official launch, Red5Studios fast-paced action-shooter MMO Firefall is set to receive a few new features that should further expand its interesting game-play. I had the opportunity to go down to the studio in Laguna Hills last summer and spend a day with my hands on the game and grill the developers with all kinds of challenging questions. I came away from that preview impressed by the forward thinking that was going into the game and driving the bits of innovation it brings to the table. I ended up entrenched in a battle-frame for weeks and nearly hitting the level-cap during that short time-frame, despite the fact that sci-fi and action-shooter games are definitely outside my comfort zone. The highlights of the game to me were the fast-paced combat, the polish, and how incredibly smooth and solidly both of those elements fit together. I never felt clunky, heavy, or slow in the game - which has often been my lament with most shooter-style action games. More than anything though, the precision of firing always felt very tactile and rewarding. Even though I haven't been playing it as often, I still pop in to check up on things and merc through a few more levels whenever I get additional game-time in my week. That being said, I think I'm going to need to find a way to reorganize things this week with the 1.3 update and the addition of a brand new end-game (level 40) feature: Warzones. Social gaming mechanics are always a major attraction to me, and warzones look to add in even more cooperative (and competitive) gameplay with and between players. While I believe Firefall is still trying to find its way in a overcrowded and highly-distracted market, the game has tons of potential. War in the Amazon looks to help fill out some of that potential as this shooter MMO attempts to wiggle closer towards the spotlight. Whether you've never tried the game prior to launch (as it's seen significant revisions since its long and confusing beta stages) or have a frame or two maxed out but haven't played in a while - it's definitely worth picking up to dig into again. There are a few new types of Chosen enemies to battle and a unique new area to engage them in; these enemies are also different enough that the update includes new gear and equipment designed specifically for the job. 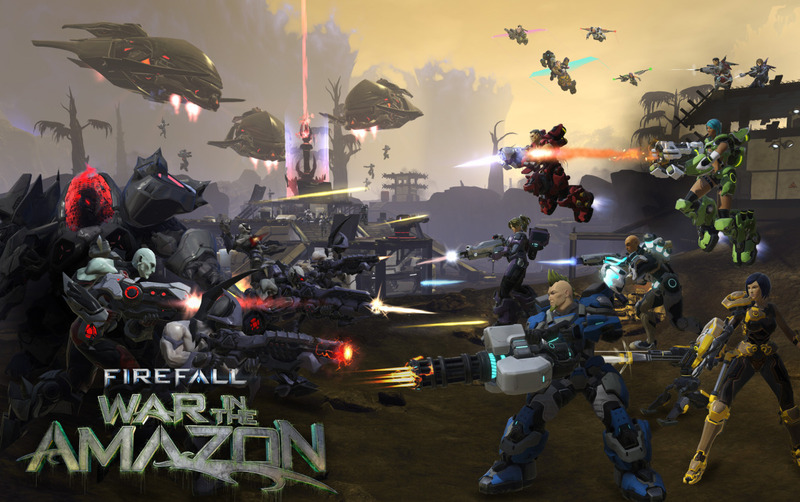 Be sure to check out Firefall's official website for their own visual preview if you're interested.